I have just notice that one main reason of the scarcity of post is not just because the lack of free time, but also my own expectations from it. Every time I wanted to rush to post up something, I would in the end put it off or did not even start due to the fact that I know I would not be able to give my best. I guess its time to change my mindset a little, after all, when it comes to blogging it should be about the flexibility, the freedom to express oneself and most of all, it should be enjoyable. Of course I do enjoy writing, but sometimes I might just be too hard on myself. Enough of self-ranting and let’s get on with the food. Oh yes, I promised you my food excursion up north, didn’t I? Drag myself off the bed to the bathroom, wash up and dress up hastily. Got into my little black car with J and sped off northward bound. Did not have enough sleep but strangely felt seriously energized, thinking of all the food to come (the wonders of being tham-jiak). Finally crossed the Penang Bridge and had arrived at food paradise. The air seems mixed with sea breeze and food smell. Now it is probably the morning sickness or it is just that I am really hungry. Finally, after just a short search, we got to our first food destination. We stopped by for the infamous Sg. 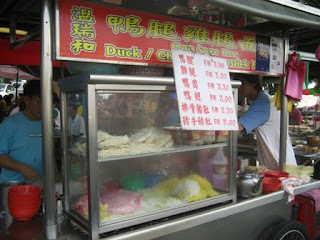 Pinang Ark Thooi Mee Suah (Duck Leg with Fine Wheat Noodle). We ordered for it and after some time, it still has yet to arrive, I got agitated, went over to reorder then they told me ark thooi has just finished and they recommended me to take keh thooi (chicken drumstick) instead. Oh well, I just obliged as my stomach seems to get grumpy. This keh thooi mee suah also came in the same broth as the famous ark thooi, which is double boiled yok choy (herbs) soup. The ingredients, I believe should be of the usual yok choy herbs such as kei chi (wolfberries), tong sum, wai san, ginseng and so forth. It was really energizing as a breakfast, and certainly fueled me with enough energy to wander around whole day in my food adventure. The mee suah deserves a mention as it was exceptionally soft and smooth, without the floury coating which can be found in commercially made mee suah, and certainly complements the yok choy broth well. After that good and hearty noodle soup, our hopes are high as we gaily drive to the next destination which was just a few streets away. We got over to get some less heart healthy stuff which the famous Penang char kuey teow (stir fried flat noodles) at the famous Lorong Macalister but alas, when we got there, the store was close. 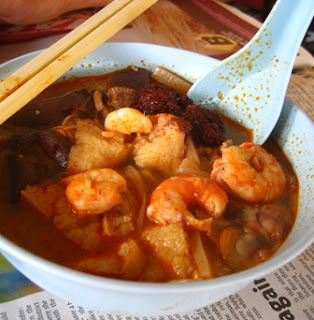 So we head on next to another killing delicacy that is the famous Penang curry mee (noodle). This one we got off the internet from Penang Haven, which she mentioned that this stall is known as the brothers curry mee. This is because the stall, which was passed on by their father, is run by a sibling. I just had to go there to see what the fuss is all about to be able to remain reputable for two generations. The noodle came, just like how authentic Penang curry noodle should be, with prawns, cockles, pig’s blood cubes, sotong (squid) and beancurd. J tasted the noodle first and found nothing special about it (I guess he is accustomed to the KL style ones) thus he took the liberty and add huge dollops of sambal, available at the table. After that J announced that now it was good and so I have a try at it. I love the spiciness (thanks to J) and also enjoy the extra flavours from the ingredients aforementioned. Certainly different from other curry noodles I used to have. After sweating all over from the spicy curry noodle, we got back into the car and drove down several blocks to Lorong Bangkok (Bangkok Lane). 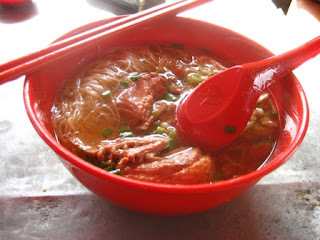 Here, is specially taken by J as he had tried it once, following a Penang food-lover friend, as a typical Penangites, who took him there before. 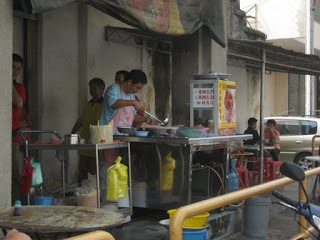 J swore that this stall has the best mee goreng (fried noodle) you can ever find in Malaysia. 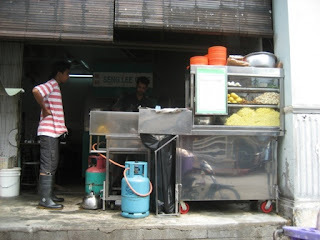 We arrived at the humble restaurant, where the mamak stall is located. J ordered for the mee goreng in Hokkien, as the mamaks there in fact had learnt to speak this ubiquitous dialect of Penang. I was certainly impressed. The noodle came looking redder than the usual mamak mee goreng. One bite and I am totally won over, I was never really a fan of mee gorengs of any kind, but this is certainly different. 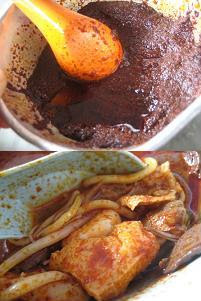 As the stall also sells mee rebus (literally boiled noodles), which comes in thick sauce (consisting of potatoes, curry, soybeans, shrimps and peanuts), which usually comes with marinated sotong, tau kwa(firm tofu) and beansprouts. 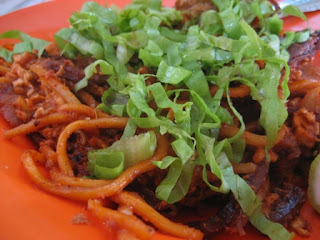 Judging from the taste of the mee goreng, I can guess that they had used the mee rebus kuah (gravy) to fry the noodle. Eating it you will find sotong (which was marinated well before hand, thus extremely flavourful and without the fishy taste at all) and mashed up potatoe. It is certainly hard for me to explain how special this plate of mee goreng is, I guess the best way is for you to head on there for a try if you had the chance, I personally recommends it. Then filled up with spicy fried noodles, I am thirsting for something refreshing, something icy. J and I got into the car and sped off once more in search for more.